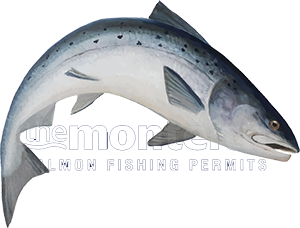 Logically if your a religious 'catch stats' follower and only book your salmon fishing once you see salmon being caught then in many cases you'll have missed the boat or there will be no actual rod availability left to purchase when your moment to book arises. Our business in 95% of cases is about being in the right place at the right time during the fishing day as opportunities to catch salmon arise on the vast majority of Scottish salmon beats on a day to day basis. Half the battle for success is being able to recognise these 'windows of opportunity' when they open and knowing exactly how to hook, play & land a salmon in order to take advantage of them. When you spend enough time on the salmon rivers of Scotland you'll develop a 'sixth sense' for knowing where & when the time is just right for a cooperating salmon during the fishing day whether you see a salmon move or not. It is this 'sixth sense' that is the real attraction for me and for those who've been in the game long enough to appreciate what I'm saying here. Salmon fishing in Scotland is a really truly magnificent pursuit which is far more in depth than just understanding the various tackle systems and vast array of salmon flies that are on offer these days. The vibe of the salmon river & understanding it is when you really start to develop 'real' salmon fishing skills and your 'attempts to catch' ratio will start to soar high. Fine tune your appreciation of the Scottish salmon rivers and the very subtle air and light changes and other relevant factors that can all of a sudden bring a fresh head of salmon up into the pool your fishing or switch older resident salmon on where they'll all of a sudden wake up and be ready to take your fly. Whatever you do though don't think this business is only about a digit on a daily catch return system as that often bears zero relevance to the fishing potential if you've the wisdom to look deeper.